Useful but needs diacritical marks!!! 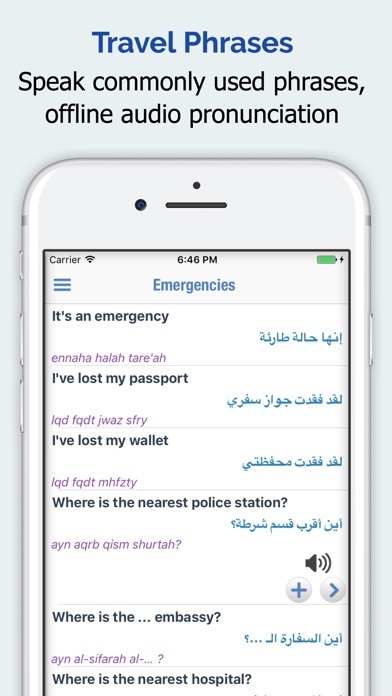 I am new to the arabic language and this app would be infinitely more useful if there was a toggle for the diacritical marks. Deserves the 5$ surely Except the scanning topic cause it really bad ! Dont update it, delete it. Very bad app, delete it and use google translate. I love it. My go to app. audio for most words/phrases do not work. if dev put more time and effort into solidfying the dictionary and making all audio components work, i'd rate it higher. instead dev puts out a half-baked app where it tries to be a language dictionary and game at the same time, so nothing really works to its full potential. very poor execution. this should be a standalone dictionary--no games or quizzes. there are plenty of games on the app store. dev should concentrate on making the app the best and most fully comprehensiveand fully functional language app that it can be--with special attention given to having all audio translations working. until then...it's gets deleted. The sound doesn't work on the pro version and no app support number? This app is been my favorite app for a long time. I like it so much because it helps you with the spelling. Helps giving meanings clearly. Word of the day is a good idea because it urges me to open the app everyday. Thanx DEV. I have been using this app for years. But the latest version looks very bad. When I wanted to get more info. about a word, I used to get enough info. with helpful examples. But now, there is no enough information and explanation, only synonyms and antonyms. I'm going to look for more useful apps. برنامج رائع يمكنك الترجمه به صوريا وكتابتا .. يحتاج دعم ترجمه الجمل ليكون متكامل .. Please find a better reader in arabic as the one used must be an extraterrestrial !!!! Good big Dictionary, I recommended it. Thanks to staff. A well functioning app, seems to work pretty well. 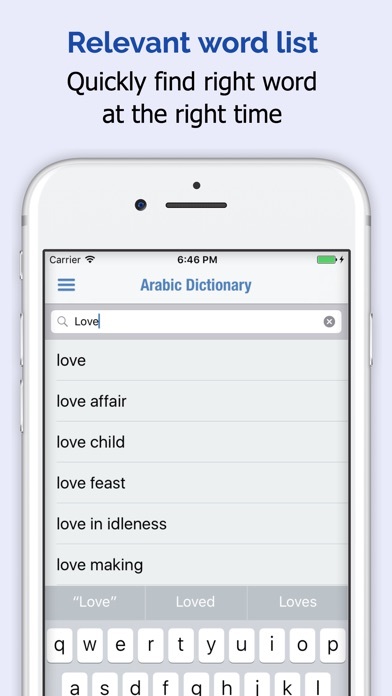 The founder and editor of this wonderful application needs to continue developing the way the words and their meanings displayed.. more punctuations, better detailing about the type of word (n.), (v.), (adj.)... etc. and of course more meanings in both sides and even little examples that explain the right usage.. Great dictionaries up their can be a great example of how should this dictionary should be.. It is very good, cause just 5 mnt. a day You can learn a something New. البرنامج جميل نوعاً ما . البرنامج حلو ولا يستخدم الانترنت بس مشكله مايترجم النصوص الكثير بس يترجم كلمه وحده واتمنى بالتحديث الجاي يصير يترجم النصوص الكثيره . Fast, convenient, and does not crash. The word games and functions are a plus and they help promote new word learning effectively. 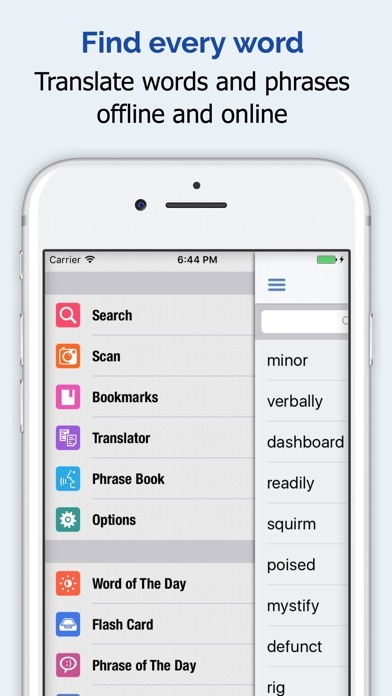 Dictionary is seemingly endless and the built in translator is highly accurate. The Arabic voice needs a lot of improvement needs correction of the pronounce . I enjoy its design and I use it all day . Thanks for the developers . 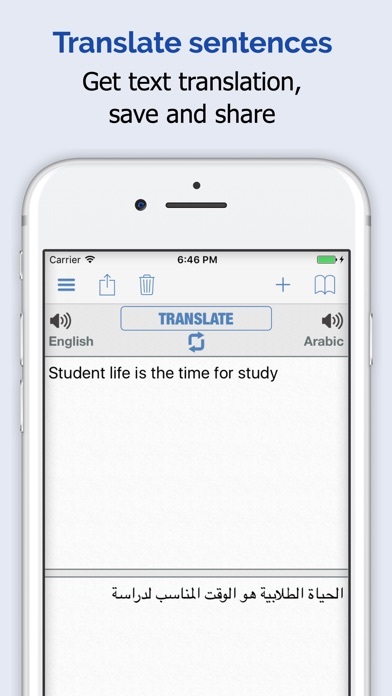 The English to Arabic translations are not entirely correct and the app is not entirely user friendly. One has to write the root of the word and not e.g in plural form- to find the word. 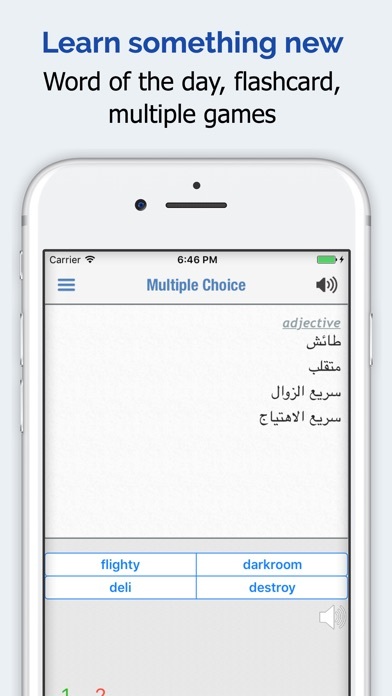 I'm learning the Arabic language so this app is very useful for me and love to really keep on learning on the go❤️.